Ok Folks, Here we are back again after a short hiatus. Actually, I was under the weather a bit, but nothing major. Everyone is a critic..... my son came for a visit and his opinion is that my hair is too red. He said it looked like I was trying to match my clothes. I will keep that in mind when I work on the painting later today. I worked on the eyes a bit and love, love, love the way this eye came out. I still have issues with the other eye. I played around a bit with other areas of my face but still am not satisfied with the likeness. By the way, I still need that face lift.....Yes, I am Vain. I am very pleased with the loose feel of the hand and hope the other hand comes out as well. After working for a bit longer on Picasso, here is a closer look at my studio mate. I totally get into the details too soon. It worked out ok this time, Picasso's eyes are so realistic, but I totally messed up my eyes. Naturally I am not going to show you my flawed abilities. We woke up to snow this morning and that was such a blessing for me. I had a day of errands and chauffering my husband to therapy all planned out. 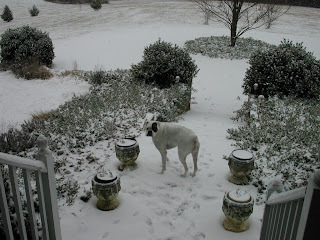 Can you believe it, I am getting a snow day just like when I was in grade school. I have been in the studio all morning and am about to break for lunch. 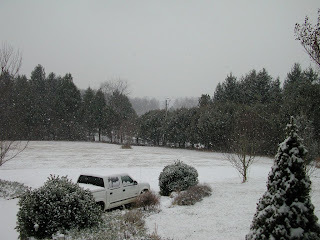 It is still snowing and we now have 2 inches on the ground. I am including a photo of my other muse, Molly. She just loves snow. And the last photo is of my view from my studio, looking west. I can actually see cars moving along Skyline Drive on a clear day. Am I blessed or what? After lunch I will continue on and give myself a bit of a facelift. Ok, So I am a bit vain. I have another great blog for anyone interested in copying at The National Gallery of Art. I am a copyist there and my fellow copyist, Amy Mann started a blog some time back. Naturally, being the technologically challenged person that I am, I misplaced her blog address. At the time she sent me this blog, I thought WAY COOl, but did not try it myself for fear of the computer . I always make a mess of computer stuff. 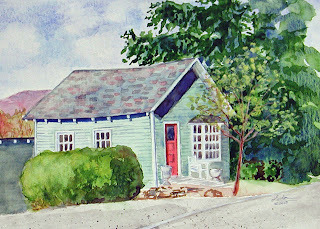 Anyhow, you have got to check out http://amymannpaintingaday.blogspot.com/ which also links you to her National Gallery copyist blog. OK folks, here it is. I am laying my heart out in the open for all to view. Please be kind! My son gave me this beautiful Snowshoe Siamese kitten. He even named him for me....Picasso. So, I naturally wanted to paint him and I decided to tackle another self portrait in the process. Picasso was so easy to paint. My husband says I never have trouble painting those I love. But, I have had a difficult time with my self portrait. I am told by one friend that I am too harsh with my likeness and I am younger looking than I painted myself......so I tweaked it a little. Then my next friend said I did not look anything like she thinks of me....meaning my attire and hairstyle. She suggested my usually short hair cut and blue jeans. Well of course I dressed up nice and fixed my hair and makeup. After all, this is for posterity and no one wants to be remembered as a hag, unless you are Van Gogh. Anyway, enough of this vanity problem. Lets discuss the process. I did a slew of photos one day after getting all gussied up. Picasso was such a ham and just loved the attention, so he was very accommodating. I have a huge mirror in the bathroom which I set up my easel in front of and got the selfportrait drawing down and added the figure also from life. Picasso was then added from the photos and observations of him in the studio. I then moved to the studio. I had a mirror adjacent to my easel so I could work from life on myself. This is the painting so far. I have worked on it for about 25 hours. Let me just say this, It is the most difficult thing I have ever done, being objective about myself and not letting vanity interfere. I did Picasso in about four hours in one sitting. He was soooooo easy to paint. Brett is right, I have no problems painting those I love. 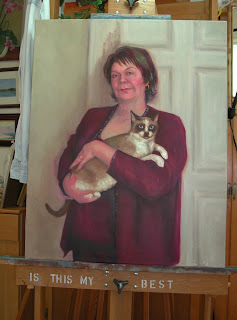 Over the next few days, I will post further progress with this painting. Maybe I will even get a good likeness that everyone agrees is me. 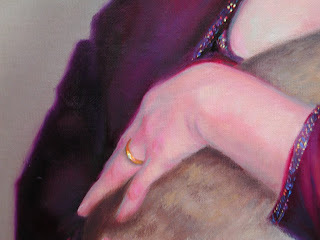 It is high time I mention that this blog would not be happening if fellow artist, Tricia Ratliff, had not come out to my studio in Marshall, Virginia for a visit last week. Tricia brought along her adorable son Ari, who quickly bonded with my cats and husband, Brett. He was quite at home in the studio playing with his toys. It was a nice break from the solace and quiet of the studio out here. I rarely have visitors at my studio in the remote foothills of the Blue Ridge. On top of the location here, I have been caring for my husband who is recovering from hip surgery, and it has literally been weeks since I have been out and about in a social situation. Tricia and I met at classes with Rob Liberace and have found much in common. We are both realists looking to make our mark in the art world and both love all things art. 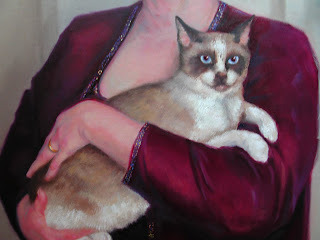 Tricia has a great blogspot at, http://agilearts.blogspot.com/ and I am a huge fan. Be sure to visit this blog, it is great. I have wondered about doing my own for some time, but it was not until Tricia gave me a prod and some valuable insights, that I dared to try it. I am working on a selfportrait titled "Picasso and I" and will start tomorrow with postings on it's progress. Be sure to check weekly on "Picasso and I". 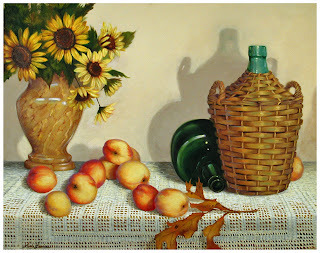 I just received back my unsold entry "Vanitas #1" from the Richeson 75: International Still Life and Florals Competition. It was juried into the competition by Terry Howell Stanley, Director of Richeson School of Art and Gallery. The competition and subsequent show was held in Kimberly, Wisconsin. The show was also hosted on the web and a lovely exhibit catalog was printed. I strive to enter the very best shows and concentrate now on those shows which offer a good cash prize as well as an influential show in a gallery setting. 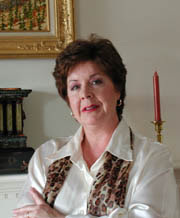 Welcome to Linda Lawler's world! Hi and welcome! It is finally inauguration day, a day for change and new directions. Please journey with me as I surge bravely into the future and tackle my computer yet again. My name is Linda Lawler. 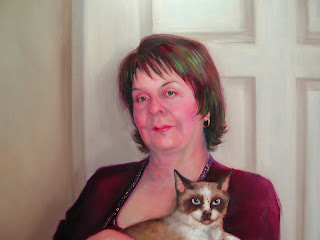 I am a realist painter and portrait artist living in the foothills of the Blue Ridge Mountains of Virginia. In future posts, I will tell you about my personal journey as an artist and what directions I hope to take in the future. I will talk about art, the art world in general, and the techniques I employ to create my works. If you are wondering about my blog moniker, be assured I am not so egotistical as to think I only create masterpieces. It simply alludes to the fact that I am not disciplined enough to paint every single day and create a great work of art every single day. And so, I will strive to paint as often as possible with the intent to work towards a great work of art each month. Along the way, I may develop some better work habits and discipline. Along the way, I will learn and along the way, I will pass onto you some of what I learn.